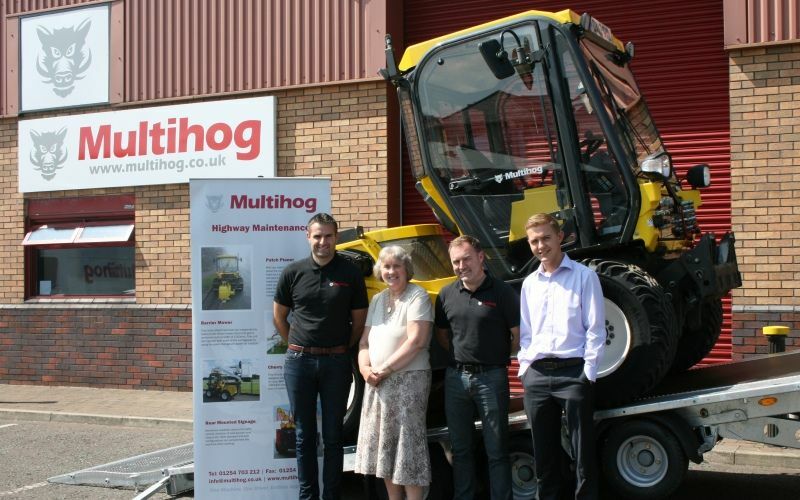 The Councils Executive Member for Regeneration Councillor Maureen Bateson meets with Multihog bosses after approving a £9000 Assistance to Industry grant. Multihog UK Ltd, who is now based off Charles Street, was offered the monies as part of the Council’s Assistance to Industry programme. The company relocated to a much larger site to assist their business expansion and needs assistance to purchase a workshop ramp, racking and a plant trailer. Assistance to Industry grants are delivered on behalf of the Council by Regenerate Pennine Lancashire. They are awarded to companies to help them expand and are related in part to the number of jobs being created. Multihog UK Ltd is a young business established in 2010 and the current Directors, Nick Carter and Nick Leadley, have vast experience of sales and marketing of plant and capital equipment and saw an opportunity to import a new multi-purpose implement carrying vehicle, the Multihog, which was being developed and manufactured in Southern Ireland. The Multihog base unit itself has the appearance of a road legal compact tractor which is articulated and hydraulically operated, accepting a diverse range of different attachments to the front and rear allowing for effective and efficient all-seasonal utilisation. With the launching of three new Multihog models this year and to meet the growing demands of a business on the up, the firm have moved from their previous base in the village of Hoddlesden. The new premises now benefit from a showroom, offices and meeting centre in addition to an engineering workshop and storage unit. Two new jobs have also been created. Listen below to hear Multihog bosses and Cllr Maureen Bateson discuss how this funding will help the business and the Borough grow together.